Barack Obama, who is the current predator drone missile president of this nation, and also the first nominally black U.S. Head of State and Commander-in-Chief of the military forces of the United States has given a renewed horrible significance to Dr. King’s above quoted words. In addition to Barack Obama’s unceasing and bloody (overt and covert) military attacks on the sovereign nations and peoples of Afghanistan, Pakistan, Yemen, Somalia (East Africa), and Libya (North Africa), etc., in egregious violation of international law; the articulate corporate owned Obama has, in real terms, shredded the U.S. Constitution – particularly as it pertains to the civil liberties of the everyday Black, White, Brown, Red, and Yellow of the United States. Notwithstanding his subterfuge, obfuscation, and double-speak rhetoric, Obama’sactions in these regards, have sent and are sending, all young people of this nation (and most especially black youth) the message that hypocrisy, greed, and/or military might are what they should be pursuing if they want to ‘succeed’ in their lives. It is a message that is absolutely and unequivocally false and dangerous! Moreover, Obama’s de facto message of hypocrisy, greed, and military war mongering negates, distorts, and destroys in the historical vision of our youth, the principles and supreme sacrifices made by persons of all colors in this nation, including Black American freedom fighters such as Harriet Tubman, Frederick Douglass, W. E. B. Du Bois, Malcolm X, Dr. Martin Luther King, Fred Hampton, and so very many others. Barack Obama is, in essence destroying the legacy of struggle on the part of all freedom and justice loving people, and in particular of Black America. This cannot be over-emphasized and it must be reversed. Barack Obama is the cynical beneficiary of the sacrifices and legacy of this struggle, but he is utterly devoid of the principles, which were and remain an integral part of this ongoing everyday people’s struggle in this nation and throughout Mother Earth. For example, in the year 1968, when Obama was seven years old, not only was Dr. Martin Luther King, Jr. (and others) brutally murdered by this corporate government – but there were also intense rebellions on college/university campuses and communities throughout this nation – calling for an end to the U.S. war of aggression in Vietnam and simultaneously struggling for ethnic studies, etc. Yet, Barack Obama – though a shameless beneficiary of and from these historical struggles and sacrifices made by many persons, has learned nothing from these struggles other than how to cynically and rhetorically rhetorically pimps said struggles – even as he today makes war (using his “guided [drone] missiles” and other assorted weapons of mass destruction) upon the peoples of Africa, Asia, and the ‘Middle East’ today. 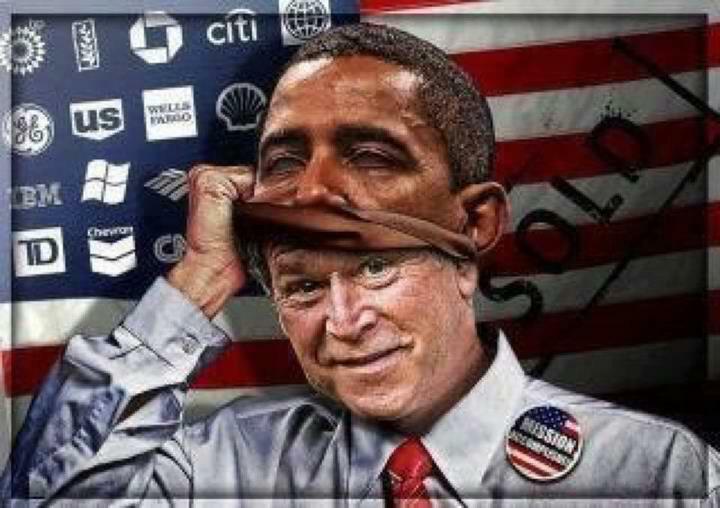 Utilizing his infamous bait-and switch tactics, and working covertly with his corporate owners, Barack Obama is also waging a less obvious but extremely devastating war upon the ordinary everyday Black, White, Brown, Red, and Yellow people of this nation. His obfuscating, hypocritical, and double-speak rhetoric is belied by his cynical, well-honed, bait-and-switch tactics and actions which he adroitly uses against the ordinary people of this land. We must not allow Barack Obama and other systemic misleaders to subvert, distort, and/or otherwise destroy our precious and important history – for in the words of Malcolm X, “Of all our studies, history is best qualified to reward our research.” And as Howard Zinn put it, “If you don’t know history, it’s as if you were born yesterday, and anybody up there in a position of power can tell you anything and you have no way of checking upon on it.” Contrary to an assertion made earlier this year by a heretofore iconic member of the black intelligentsia; Barack Obama does not “identify” with the “black radical tradition” of struggle in this nation. He is, in fact, the antithesis of it. This is urgent. Black America must reclaim its history and legacy of struggle in this nation and in so doing rejoin the collective struggle along-side our sisters and brothers of all colors in this nation and throughout Mother Earth. Obama can be Red, Green, Blue, Yellow or any other color. He is still a captive of the sytem that has put him in the position that he is in. Everyday, 10 times, his actions are controlled, managed, influenced, blocked, encouraged, supported – which is finalkly how he can get done, whatever he gets done. The optics of the POTUS are the chewing gum that we keep chewing. Then we wonder, after all the chewing, we get no nourishment. The biggest enabler for Black Power was finally the Soviet Union. By supporting Black Slave Republic like Cuba, commemorating Patrice Lumumba, the Soviets made it impossible for the US to keep African-Americans radically sewgregated. By the time Reagan became President, Black Power was already in retreat. At least this is how it appears from some distance in time – after 40 years. From a distance – from India.